Dover’s beautiful environment needs improving in target areas. We must take every chance to enhance green space within our area. We will work with partners to encourage residents and business to love where we live. 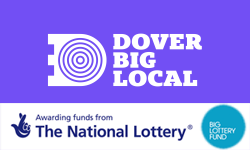 Through Big Local we aim to help make Dover a much smarter more attractive town to live in and visit; which will lead to increased health, well-being and a stronger sense of pride. DBL has continued to develop relationships and partnerships with local community organisations, including DCA, Town Team, Transition Dover, Christians in Dover and Footprints plus service providers and local authorities (Dover District Council and & Dover Town Council) and major employers (DHB, EH, P&O etc). DBL has supported the development work being undertaken with the River Dour Partnership and also Transition Dover activities. Transition Dover is a community group, formed in early 2016 to make our town greener and more sustainable. It is part of the Transition Towns’ movement which strives to make communities healthier and more sustainable through action by the people in the community. “The many excellent activities carried out in Dover have given us many ideas for extending them to our village in Adisham”. DBL provide a small grant to enable Transition Dover to purchase seeds and equipment to create a Bee & Butterfly Border. A patch of land belonging to Morrison’s Supermarket was prepared and sown by sixteen Transition Dover volunteers. The display of flowers has enhanced the community environment and feeling, litter is no longer thrown into this area and the area was greatly improved. On the day, excitement ensued with the preparation and re-sowing of the Bee & Butterfly Border. New volunteers from the Silverback Project and Dover Arts Development joined us and explained how the Giants Table at Charlton Green was created from locally reclaimed wood. The staff at Morrison’s were helpful and local residents were stopping to give encouragement and express pleasure and delight. This activity contributes to DBL’s priority area ‘Environment & Green Spaces’ and to Local Trust’s outcome ‘people will feel their area is an even better place to live’. Transition Dover also ran a fun and engaging Upcycling Fabric Workshop, with DBL contributing a modest sum. The workshop was well attended and by people of all ages, experienced volunteer tutors helped participants to gain new sewing skills and to turn their own unwanted clothing into personalised bags. 17 volunteers and participants took part, including several community members who had found out about the activity through the DBL Facebook page. “The workshop making bags from recycled cloth was an excellent alternative to plastic bags”. As a result of this workshop Transition Dover was requested by the Samphire Project to run a similar workshop creating Maypole costumes from recycled fabric for the Multicultural Festival.